The salesperson offered the gal a 10% discount for a wool cardigan missing a button. If the picky gal hadn’t snubbed the deal, she would have saved $8.50 (plus tax) on a high quality sweater with a fixable flaw. Since the extra button was still attached, I offered to take the cute cardy off the salesperson’s hands for 15% less, and went straight home to play with my sewing kit. 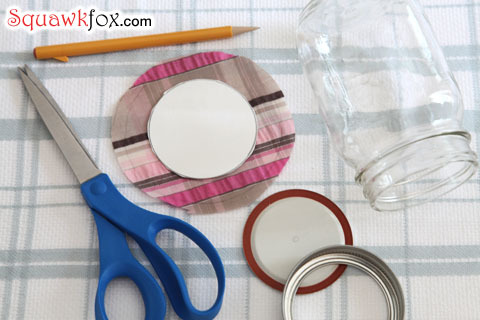 My trusty Mason jar sewing kit has been one of my secret money saving tools for years. Sure, I’ve pocketed a few extra bucks negotiating discounts on blemished clothing, but my simple sewing skills have mostly helped me mend the quality gear I already own. Extending the life of your loved clothing can save you some serious cash, and doing the work yourself may save you from paying a seamstress to do a trivial repair. Unhinged hems, missing buttons, teenie tiny holes — it’s all fixable if you keep your tailoring tools handy and in working order. 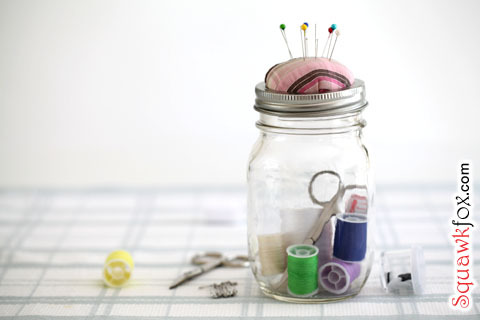 To help you get your fabric fixed, go ahead and convert a Mason jar into a sewing kit with a pincushion lid — you’ll have the cutest kit on hand to put most mending needs in stitches. 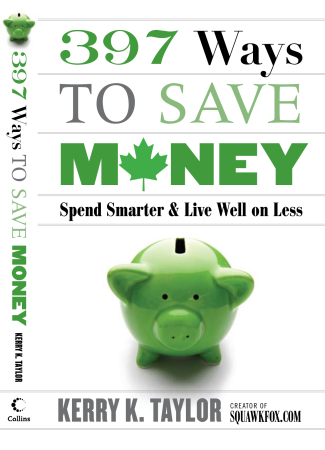 It’s the perfect gift for students, new homeowners, maybe even husbands, or anyone who gives a darn. 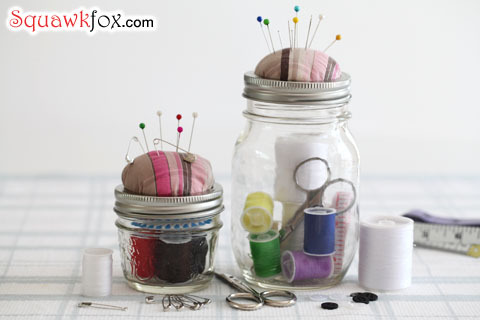 You’ll need to collect sewing items to put in the kit, as well as the bits and pieces for building the pincushion lid. It’s a well known fact that I like to stick things in jars. I’ve squished fish (not real ones), I’ve baked pies (real ones), and I’ve stuffed some strangely themed things into Mason jars. 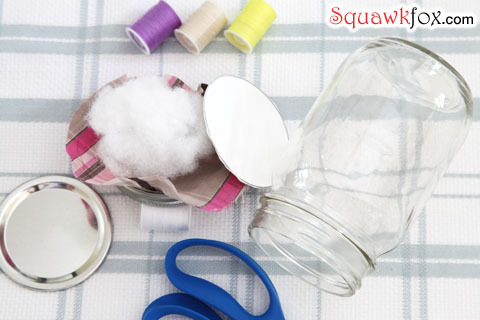 So it’s no surprise that I suggest stuffing a few sewing staples into a jar as a thank-you gift too, but you’ll need a few sewing instructions to complete the craft. 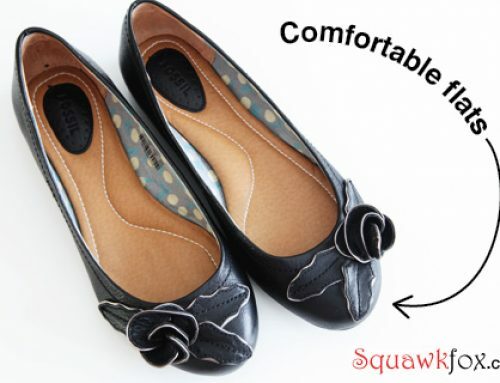 A few easy steps to sew up this project. STEP ONE: Separate and trace. 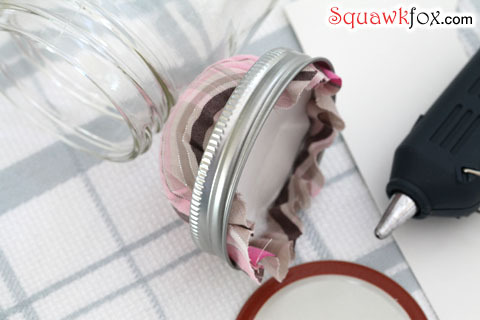 Separate the Mason jar lid sealer and screw cap. Trace the lid sealer onto the cardboard. Trace another circle one inch larger onto your fabric. STEP TWO: Cut and cushion. Cut out both circles. Plump up the fabric circle by stuffing the batting between the cardboard and fabric circles. STEP THREE: Glue cap. Assemble. 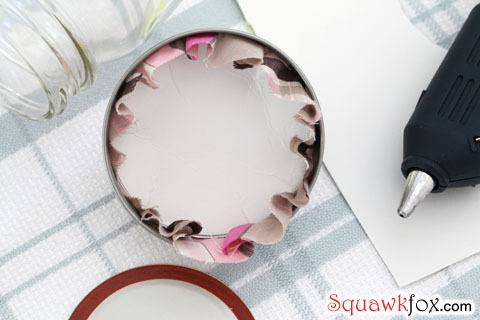 Turn the screw cap upside down, and sandwich fabric, batting, and cardboard pieces together neatly. Glue down fabric around the exposed cardboard, then stick the top of the lid sealer to the cardboard so the fabric is cleanly contained. 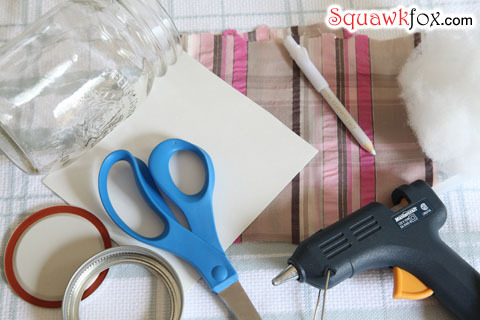 Press firmly, and screw onto Mason jar until glue is dry. STEP FOUR: Fill. 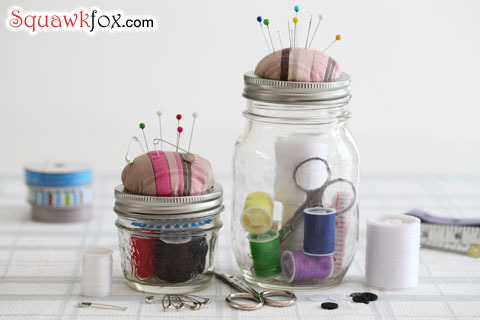 Fill your sewing kit with mending supplies of your choice, and top the pincushion with a few needles. STEP FIVE: Mend something. A few instructional videos for your (improved) sewing pleasure. Question: Do you mend your clothing? I don’t mend our clothing, but that’s mostly because the damage done isn’t the kind that can be mended. I’m talking about huge gaping holes, not just a button or two. But then again, it’s 4-6 years of wearing the item before it’s worn out, so I can live with that. I do sew a lot, though. Mostly stuff like curtains, bags of different sorts, and sometimes even a hat. This year, I’ve made a lot of baby things already–I’m mostly finished, but there are one or two more little things to do before I can put the machine away for good. I think I just found my christmas gift idea for all my friends! I almost always mend our clothes. The exception would be darning socks. 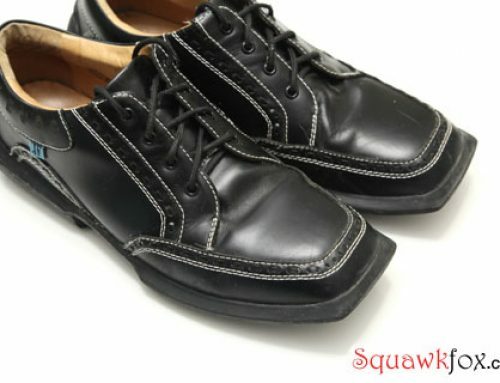 My mom showed me how to do it when I was a kid, but I always hated wearing darned socks. That little lump was a downer. Then my chiropodist coworker told me she recommends NOT wearing darned socks. Oh happy day! 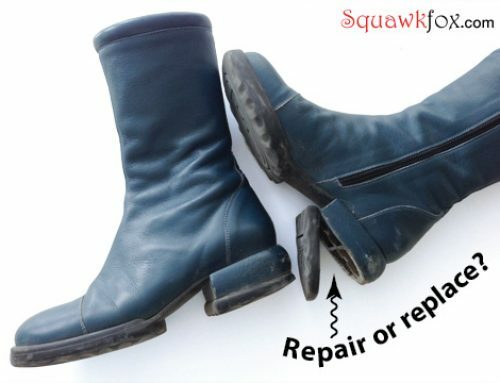 No more guilt about turning holey socks into rags. Hi, For socks to clean mini blinds. Put socks on your hands, and a sink or tub of soapy water, rub the blinds till clean, rinse. This worked for me. Love to sew and have made a lot of clothes. I enjoy sewing as well and have built up a very extensive sewing kit over the years – so much so that I’ve had to make use of a tool box to keep everything in! While many folk say they don’t enjoy sewing, it is an absolutely essential skill to know because over the years, it can save hundreds, if not thousands of dollars. Great post, Kerry. I patched a hole on the knee of pants I would not have worn again otherwise. If done neatly, it is hardly noticeable. I thank an American domestic diva for that explaining that skill. Maybe an idea for future posts? If you never learned to hem by hand, which I still do, a sewing machine is great for that task, as well as for repairing hems that unravel. I’ve made my own curtains and table cloths. So easy it’s laughable. So true, Kerry. I’ve saved a boatload of money on clothes over the years, buying sizes that didn’t quite fit, then altering them. Or buying clearance items with slight imperfections, like that missing button. 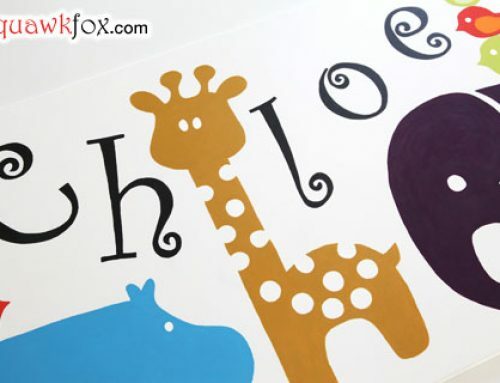 This is an absolutely adorable idea and I want to make one for my daughter. I still use my grandmother’s sewing box, which I inherited. My mom taught me how to sew and it saves a lot of money on replacing clothes. 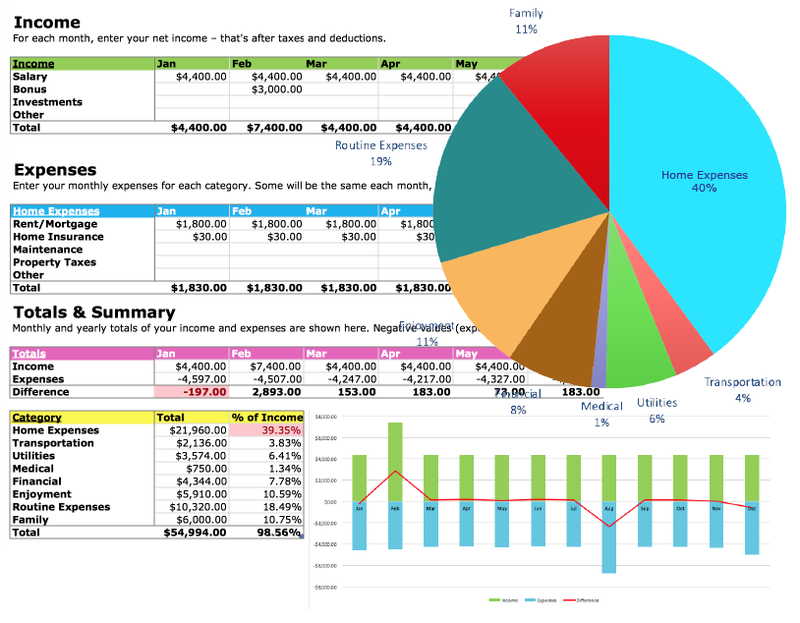 great article, and like others, I can see gift possibilities! I’ll be making one for myself while I pound my head and say duh! 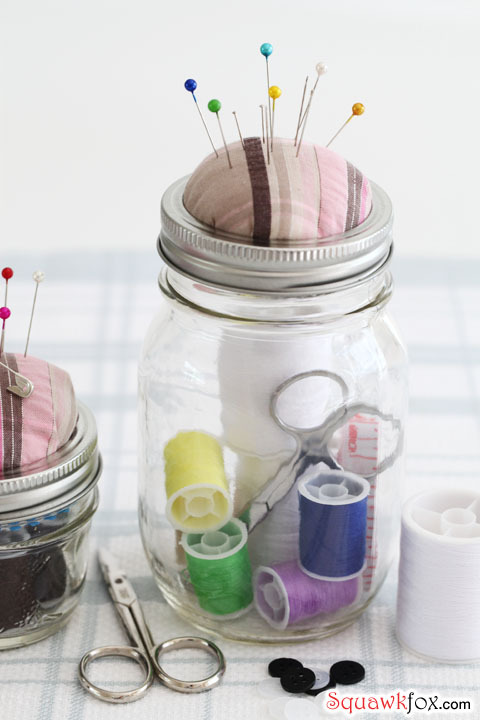 I take those buttons off cloths but seem to lose them before I need them, so including them in this jar is a great idea. One QUESTION: why are the videos private?